This product has been specially designed to give an immediate colour to the skin in Vitiligo. Viticolor contains a combination of 3 approved colouring agents (CL14700 red, CL19140 yellow and CL42090 blue) which give immediate colour to the skin with a pigmenting base containing DHA and Erythrulose to give long-lasting colour. The colouring agents are used to provide you with a guide to ensure accurate application of Viticolor and will wash off if the skin is washed immediately after application. Washing does not adversely affect the action of the pigmenting base and the full impact of each application will only become apparent around 8 hours after application. Apply Viticolor gel to the depigmented areas by using the brush provided in the pack. With the flat part of the brush start to apply from the centre of the depigmented area, gradually drawing the product in circles towards the border to avoid any demarcation. Allow to dry. After 8 hours assess the colour match with the surrounding skin. If the colour is too light then repeat the application every 8 hours until you reach the desired colour. 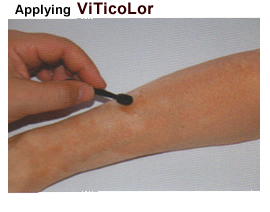 Viticolor provides a long lasting effect. One or two applications a week are all that is then needed to maintain this colour and you can wash and shower as normal. Please ensure that Viticolor is fully dry before putting clothing over it as it may leave marks on clothing. 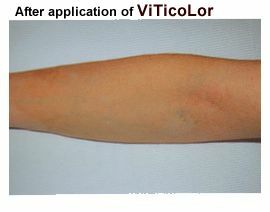 The use of Viticolor is progressive. Over time the level of camouflage will build up to match the colour of the surrounding skin. Don’t expect immediate results from a single application. Aqua (Water), Butylene Glycol, Dihydroxyacetone, Alcohol Denat, Sodium Polyacryloyldimethyl Taurate, Hydrogenated Polydecene, Erythrulose, Citric Acid, Trideceth-10, Cl 42090 (Blue 1) Cl 19140 (Yellow 5), Cl 14700 (Red 4), Chlorphenesin, Phenoxyethanol, 0-Cymen-5-ol.